Born in Paris (France), in 1970, Fabrice Sapolsky has broken into the comic book world as creator of the French magazine about American comics Comic Box in 1998. But in december 2006, he wakes up one morning with the idea of alternate reality Spider-Man set in the 1930s. After sharing his idea with David Hine, they both decide to pitch it to Marvel comics as Spider-Man Noir. The first mini-series, is published between Dec.2008 and March 2009. A second series, Spider-Man Noir: Eyes without a Face will follow a year later (Dec.2009-March 2010). Both series have been blessed with critical and commercial success. In 2014, the writer comes back with a new project, his most ambitious to date : One- Hit Wonder with superstar Ariel Olivetti on art. Fabrice got the idea of the name and the commercial star turned hitman concept in 2012 while talking to his friend (and hugely talented writer) Joe Keatinge. 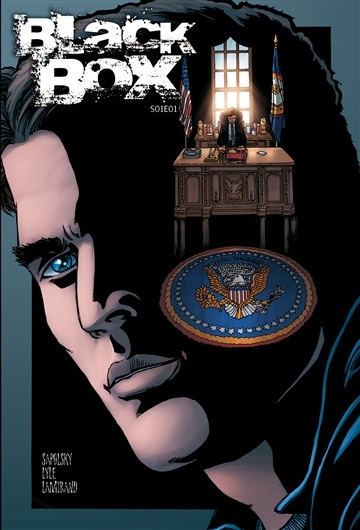 The series has debuted in the US, through Image Comics, in February 2014. In September 2014, Fabrice Sapolsky reunited with David Hine for Edge of Spider-Verse#1, a new Spider-Man Noir adventure that tied into the massive SpiderVerse crossover at Marvel. He actually works on a few creator-owned series, notably <strong style="font-size: 14.3999996185303px;">Harem, a post-feminist comic book.BlackBox with art by veteran artist Tom Lyle and coloring genius Sebastien Lamirand has been produced in 2011 for the French market but never released in the US… Until now. Tom Lyle first came to prominence as penciler on DC Comics' Starman with writer Roger Stern. He went on to work on the first Robin limited series with writer Chuck Dixon. The series was an enormous surprise hit, prompting many reprintings of the first few issues as well as two sequel miniseries — Robin II: Joker's Wild and Robin III: Cry of the Huntress — both of which reunited the creative team of Dixon and Lyle. Lyle's next project was The Comet for DC Comics' Impact Comics imprint, which he pencilled and plotted with writer Mark Waid contributing the scripts. At Marvel Comics, Lyle co-created the character Annex in The Amazing Spider-Man Annual #27 with writer Jack C. Harris. As penciler of Spider-Man, Lyle was one of the artists on the "Maximum Carnage"and "Clone Saga" storylines which ran through the Spider-Man titles. Lyle's other work for Marvel included ThePunisher vol. 3 with writer John Ostrander and Warlock which he wrote himself. He is also the artist on the comic Chickasaw Adventures. Since 2005, he has been teaching sequential art at the Savannah College of Art and Design.